It’s not happened yet, but I can feel that the bulb lust will soon be upon me. I work my tiny garden intensively and only manage to get four season colour into the border by packing in bulbs among herbaceous perennials. It’s probably inconceivable for me to stuff any more tulips into the hall border near my office window, but for May through August interest, I’m planning for more alliums, more lilies and possibly my first camassias next year. I saw @lialeendertz ‘s piece in the Guardian about alliums and it underscores the most useful thing you’ll ever want to know about ornamental onions: if you don’t hide their tattered leaves with something, you’ll be sorry. I’ve just tucked mine in among astrantia, nepeta and delphiniums and I’m hoping for the best. So yes, I’m renewing my commitment to summer flowering bulbs to squeeze maximum colour from my small space, but it’s the late winter and early spring flowering snowdrops, crocus, chionodoxa, narcissus and most of all tulips that cast the real spell over me — and my budget — every autumn. Do you remember how the Catholic church got into a good bit of trouble some centuries ago for selling indulgences, advance absolution for future sins? Hell was big back then, and folks terrified of dying with unconfessed sins on their conscience paid big sums for indulgences, hoping to guarantee life after death by ensuring they’d die “clean”…or so the reasoning went. Spring flowering bulbs are a bit like indulgences: against reason, gardeners faced with the dying of the light invest too much every autumn, trying to guarantee life for their borders on the far side of winter’s chasm. For me, planting spring bulbs — especially those chestnut brown tulips, fat and perfect — is like casting a rope to the other side of January, where my friendly bulb vendor secures it and talks me across with comforting words about “brave crocus” and tulips “like a Dutch still life”. I can resist the crocus (they may be brave, but they get battered by day two), but the tulips will always have a hold on me. Actually, my bulb vendor is very friendly; Anne and Jack Barnard at Rose Cottage Plants have never sent me tulips that failed to dazzle or, God forbid, were wrongly labeled, an experience I’ve had many times with other mail-order companies. The blackcurrant tinted late purple parrot “Muriel” they recommended last year was indeed stunning, and this year they’ve sourced “Happy Generation” for me, one of the many I saw in my Keukenhof tour this past April, but not usually available from Rose Cottage Plants, as Anne says her customers often avoid bi-coloured tulips. I’ve ordered 30; who knows where I’ll put them, but maybe in pots at the gate. If you’re trying to decide what tulips are worth buying, definitely ask your vendor, or see these two video tours of the Keukenhof tulip tents I made earlier this year. 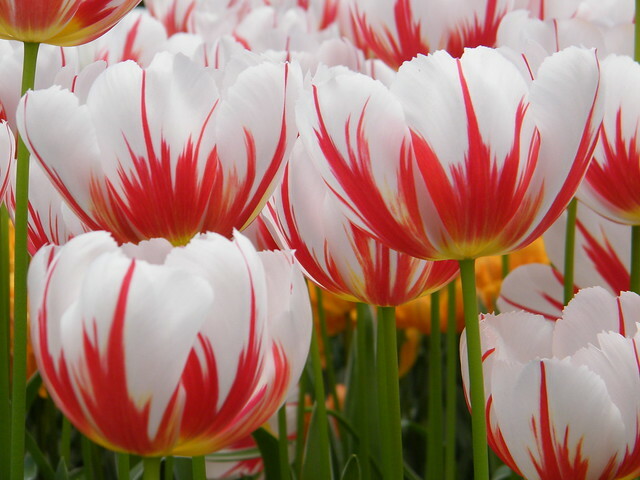 My voiceover rambles a bit, but you will get a sense of how many beautiful tulip varieties look, rather than relying on the hyperbolic catalog descriptions. You can also see still shots of the tulips and other parts of Keukenhof in my Flickr set. I have scattered galanthus nivalis, a February flowering double snowdrop, among my hall border and would love to plant a short, black centred perennial like Rudbeckia, whose black eyes might hold on through the snowy months to give me a black-and-white effect in late winter. Any ideas? Rudbeckia “Goldsturm” looks good but seems a bit too tall. Do you have a bulb addiction? Which tulips mean the most to you, and can you get away without lifting them annually? Only the year before last did I start liking tulips. Last year, I grew some for the first time. One group were multi-petalled and bright yellow and were wonderful. The other group was supposed to be green petalled. I thought that would be restful and interesting. But they turned out to be the right shape but an unsightly salmon pink. It’s one of the rare occasions when I’ve dug up plants rather than cosset them. Thanks Nic – isn’t it frustrating how large-scale you need to do things before they make a visual impact? I picked up a great value perennial lobelia that I was able to divide into two plants right away and put into the border, but they virtually disappear amongst everything else. You must be very accomplished to have your allotment; I have a small raised bed which has produced a satisfying handful of vegetables and fruit for us this year, but the sheer size (and relative absence of flowers) of an allotment would overwhelm me. Can you recommend a good pea? I usually plant sweet peas in October to overwinter, and considering doing the same with eating peas this year. Hi Esther – I wonder if the bulb company sent you the wrong thing? That happens shockingly often. I ordered pure white tulips and ended up with “spring green,” which isn’t a bad tulip, it’s just not what I ordered. I believe the green flowered tulips do hold their color for a long time, so it’s probably worth persisting to get a green one you like. How I agree about the bulb obsession. If I had a field, I’d go Dutch and plant squares of all my favourite varieties. ‘Happy Generation’ is usually in Parkers Wholesale catalogue. It’s a bit too ‘blood and bandages’ for me but is certainly striking. Alliums’ faults are over-stated, I feel. They don’t all suffer from dying foliage when in perfect blooms and those that do are easy enough to site so their nasty trousers don’t show. I have a nice patch of yellow Allium moiy – an ancient garden plant with nice glaucous leaves and buttercup yellow umbels, quite well on into early summer. It’s a nice partner to geums in the orange range. Sorry, rushed comment – I’ve used ‘nice’ not once but twice!! Mea culpa! I was thinking recently of an earlier comment you left on my post about edibles, because I’m enjoying much more tastiness now — tomatoes and strawberries and beans. I’m hoping my newer batch of carrots isn’t bitter like the last. Any idea why carrots go bitter? You just have to learn to be patient and do what you can – and this usually means accepting that some things some things work too well as well as some things not working at all. It’s quite a challenge at this time in the year with more produce than hours in the day to cook, freeze or preserve it all. I’m sad to say my peas are always a bit of a disaster thanks to the slugs. Of the few that do survive Kalvedon Wonder seem to be a nice variety. I’ve never heard of anyone overwintering peas though so couldn’t recommend a particular variety for that. I’m tempted to try it myself if you’ve had success with sweet peas but I’m sure the slugs will think Christmas had come early! 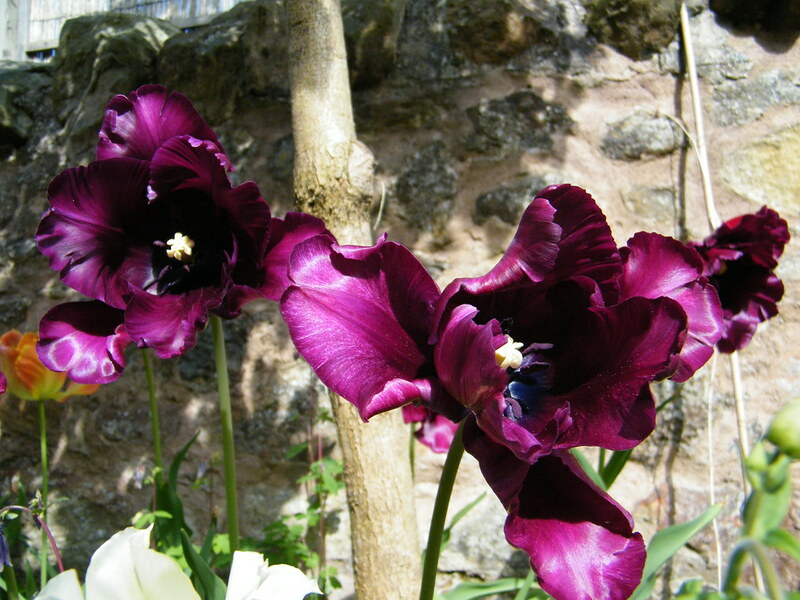 Hi Nic – thanks, I think I will pick up Kelvedon Wonder & just o-winter them in the greenhouse up high & hope for the best. That’s the variety I recently heard on the radio as a candidate for overwintering, so I think I will give it a go. Good luck with your bountiful harvest!